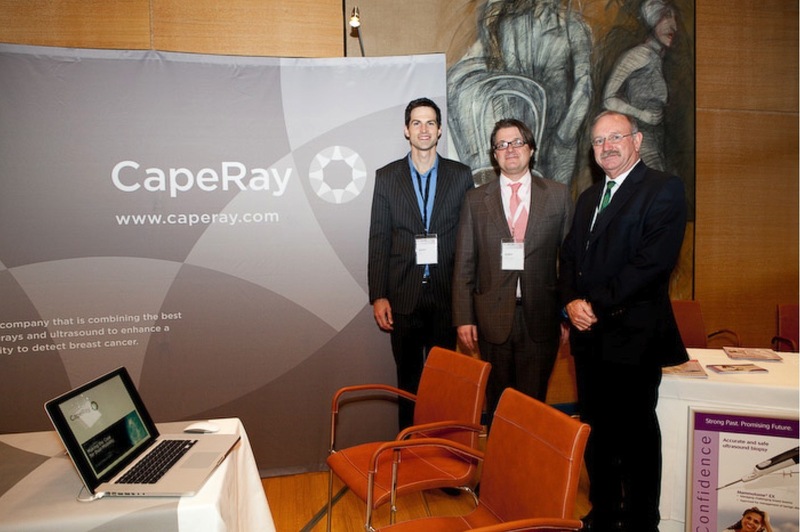 CapeRay made its exhibiting debut at the European Society of Breast Imaging (EUSOBI) meeting in Vienna recently (2-3 March 2011), where some of the world’s leading experts presented the facts, figures and future perspectives of breast imaging. Among the major topics at EUSOBI this year was the role of other imaging modalities in breast cancer screening. The most recent evidence for the use of 3D mammography as opposed to conventional 2D imaging, where overlapping tissue can obscure the detection of cancer, was presented. It was also shown that the sensitivity of x-ray mammography is greatly improved when combined with ultrasound. Roland Baasch (left) and Kit Vaughan (right) with Prof. Thomas Helbich (centre), president of EUSOBI, at the CapeRay exhibit. From the evidence, it is clear that conventional 2D mammography has room for improvement, especially in women who fall into certain risk categories, such as those having dense breasts. At the CapeRay exhibit, some of the the benefits of our dual modality approach to breast cancer screening were presented to visitors. CapeRay’s case for combining 3D x-ray mammography with 3D ultrasound aroused the attention of the EUSOBI attendees and also received coverage from the AuntMinnie online news report (click here for article).